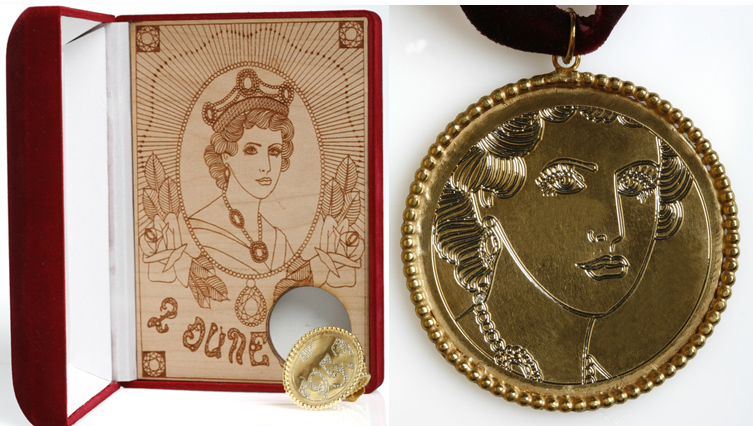 Queen Elizabeth’s Diamond Jubilee is being celebrated this weekend and artist Pip Jolley collaborated with tattoo artist, Tracy Demetriou, to create jewelry based on tattoo designs of the Queen. As you can see from the photo, the pieces aren’t full of intense tattoo colors as you may think… They are actually quite elegant. The interesting technique that Jolley used to create the jewelry, was dragging a diamond across the metal to etch the design. This particular method was used because it’s similar to how a tattoo artist applies the artwork to someone’s skin. Each piece comes in a red velvet box and comes with a print of the tattoo artwork by Demetriou. Also, included in the collection are crown stacking rings and crown charms in different metals. This entry was posted in Jewelry, Jewelry News and tagged diamond jubilee, pip jolley, tattoo artist jewelry. Bookmark the permalink.